For some folks, Halloween is more than a holiday: It's a full-time job. Ten years ago Bud Stross, 28, and Josh Wells, 31, combined their passion for scares and purchased a late 19th century schoolhouse in Cincinnati. Stross and Wells, who met at a party in high school, saw a frightening future for the brick building, known as the Dent Schoolhouse. 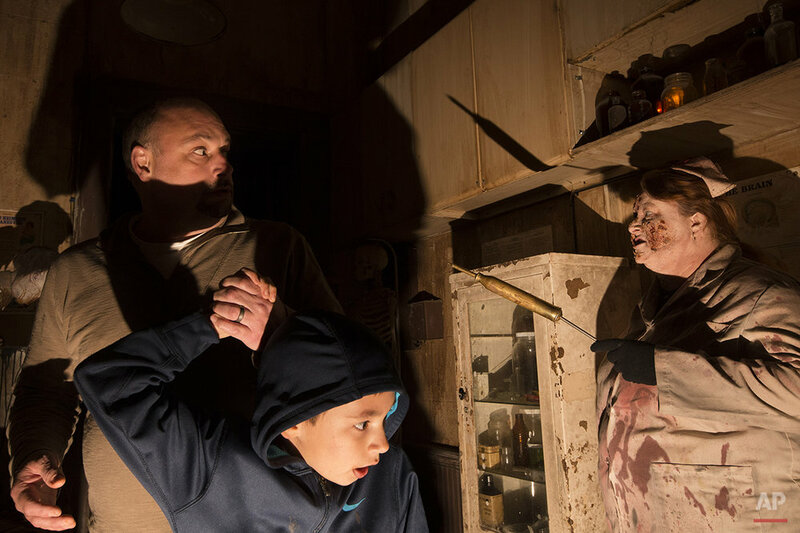 The haunted house is now their livelihood and employs 80-100 workers during the two-month season leading up to Halloween. On Nov. 1, after the actors have hung up their masks and the country's thoughts turn from pumpkins to turkeys, Stross and Wells will begin conjuring next year's frights. "As soon as one season closes we start formulating our plans for next year," said Wells. "It takes a whole year to get it ready." Stross adds, "Halloween doesn't take a break for us." The haunts change each year, requiring new sets, themes and ideas. The duo claims there's even a science to it. "The whole reason for the elaborate sets is just to kind of make them forget that there's scare at any second going to pop up around them," said Wells. "Distract them with the old junk on a shelf, and the next second a live actor is behind them." As youngsters in Fort Thomas, Kentucky, the two used to decorate their yards. Their love for Halloween grew so much they decided they needed to make it a business. "I love scaring people," said Stross with a smile. Text from the AP news story, PHOTO GALLERY: At former school, Halloween's a full-time job, by John Minchillo.